In many cases colon cancer can be prevented. 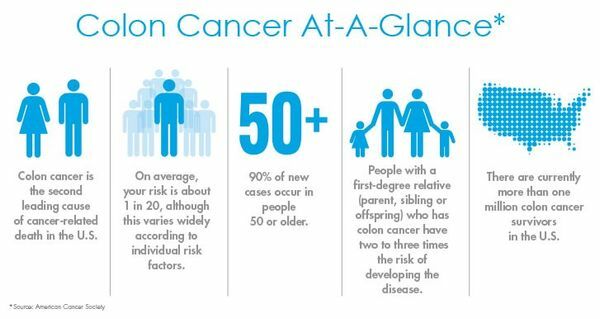 Current guidelines suggest that men and women at average risk for colon cancer get tested (screened) starting at age 50 or even younger for people with a higher risk because of a family history (parent, child, brother or sister) of colon cancer or adenomatous polyps. Q: Should women get tested for colon cancer? A: Colon cancer is not just a man’s disease. In both men and women, colorectal cancer is the third most commonly diagnosed cancer and the third leading cause of cancer death. Both African American men and women are 25% more likely to be diagnosed with colon cancer and 50% more likely to die from the disease, according to the American Cancer Society. No one knows why this is, but the lesson is simple: get screened for colon cancer. Q: Does age matter when it comes to who gets colon cancer? A: Almost all (90%) of colon cancer is found in people who are age 50 and older. This is why experts say it’s best to get tested starting at age 50. But age isn’t the only factor. If you have a greater risk (mother, father, brother or sister diagnosed with colon or rectal cancer) your doctor may ask that you get tested at a younger age. Talk to your doctor about when and how often you should be tested. Q: Is colon cancer always deadly? A: Absolutely not! Colon cancer can be treated. This is why it’s so important to get tested early when treatment is more likely to be successful. Q: What is a colonoscopy and is it safe? A: Colonoscopy is a test that allows the doctor to take a look at the large intestine for small growths called polyps, bleeding, early signs of cancer and other issues. During a colonoscopy, your doctor may remove polyps and even treat any issues discovered during the test. As with any invasive test, complications may occur during colonoscopy. Talk to you doctor about the risks and any concerns you have. Q: What can be done to lower the risk for colon cancer? A: Regular screening is important—especially if you have a family history. You can take the following steps to lower your risk: 1) Limit your intake of red meat and high fat or processed foods as they can increase your risk of colon cancer. 2) Exercise regularly. People who are not physically active, have a greater chance of developing colorectal cancer. 3) Check your body mass index (BMI). Your risk of colon cancer increases if you’re overweight or obese. Still have questions? Our patient navigators are here to help. Call 718-920-7183 to learn more about colon health, colonoscopy, other tests that can help your doctor find colon cancer and more.